Professor Michael Coper was Dean of the ANU College of Law from 1998 to 2012, having succeeded Leslie Zines as Professor of Constitutional Law in 1995. A graduate of Sydney Law School, Michael was a founding member of the UNSW Law Faculty in the 1970s, a member of the Inter-State Commission in the 1980s, and in private practice in the early 1990s. He served in all these capacities as one of Australia’s leading constitutional lawyers, and maintained his interest and output in this area notwithstanding his long and demanding tenure as Dean of the ANU College of Law. Professor Coper came to prominence with his prize-winning 1983 book Freedom of Interstate Trade under the Australian Constitution, which was influential in the High Court’s change of direction five years later in the landmark case of Cole v Whitfield, in which Professor Coper also appeared as counsel. His 1987 book Encounters with the Australian Constitution was received to great acclaim, as was the project he conceived and co-edited to fruition in 2001, the comprehensive Oxford Companion to the High Court of Australia. In addition to his core interest in constitutional law and the judicial process, Professor Coper’s research extends to legal biography, oral history, and law, philosophy and the photographic image. With colleagues he has conducted interviews of former judges and others to create an oral history of the High Court, and has also written extensively about legal education. Professor Coper was Chair of the Council of Australian Law Deans (2005-2007), Vice President of the International Association of Law Schools (2011-2014), and is a member of the American Law Institute and a Foundation Fellow of the Australian Academy of Law. He was appointed as Professor Emeritus of the ANU in 2017, and in 2018 Federation Press is publishing a book of essays in his honour: James Stellios (ed), Encounters with Constitutional Interpretation and Legal Education: Essays in Honour of Michael Coper (Federation Press, forthcoming 2018). 'The “Intelligence of a Future Day”: The Vindication of Justice Stephen’s Dissent in Henry v Boehm (1973)’ in Andrew Lynch (ed), Great Australian Dissents (Cambridge University Press, 2016) 150. ‘Judicial Review and the Politics of Constitutional Amendment’ in Rosalind Dixon and George Williams (eds), The High Court, the Constitution and Australian Politics (Cambridge University Press, 2015) 38. ‘Geoffrey Sawer and the Art of the Academic Commentator: A Preliminary Biographical Sketch’ (2014) 42 Federal Law Review 389. ‘Educating Lawyers for What? Reshaping the Idea of Law School’ (2010) 29 Penn State International Law Review 25. ‘Legal Knowledge, the Responsibility of Lawyers, and the Task of Law Schools’ (2008) 39 University of Toledo Law Review 251. ‘Law Reform and Legal Education: Uniting Separate Worlds’ (2008) 39 University of Toledo Law Review 233. ‘Concern about Judicial Method’ (2006) 30 Melbourne University Law Review 554. ‘Currents, Cross-Currents, and Undercurrents in the Turbulent Waters of Constitutional Interpretation in the High Court’ (2003) 77 Australian Law Journal 673. ‘The Seven Habits of a Highly Effective High Court’ (2003) 28 Alternative Law Journal 59. Professor Michael Coper, a former Dean of the ANU College of Law, has been appointed Officer in the Order of Australia (AO) in the 2018 Australia Day Honours. A level playing field must be established for TruckSafe to operate effectively. A conference in honour of Professor Michael Coper. Professor Michael Coper succeeded Leslie Zines in 1995 as Professor of Constitutional Law at the ANU. 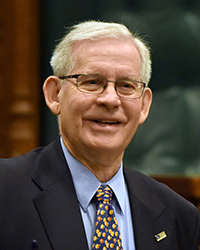 Michael was a founding member of the UNSW Law Faculty in the 1970s, a member of the Inter-State Commission in the 1980s, and had a stint in private practice in the early 1990s. He served in all these capacities as one of Australia’s leading constitutional lawyers, and maintained his interest in the area notwithstanding his long tenure as Dean of the ANU College of Law from 1998-2012. In addition to his core interest in constitutional law and the judicial process, Professor Coper’s current research extends to legal biography, oral history, and law, philosophy and the photographic image. With colleagues he has conducted interviews of former judges and others to create an oral history of the High Court, and has also written extensively about legal education. ‘Reflection’ in James Stellios (ed), Encounters with Constitutional Interpretation and Legal Education: Essays in Honour of Michael Coper (The Federation Press, forthcoming 2018). ‘Introduction’ in Michael Coper, Heather Roberts and James Stellios (eds), The Tasmanian Dam Case 30 Years On: An Enduring Legacy (The Federation Press, 2017) 1 (with Heather Roberts and James Stellios). ‘The “Intelligence of a Future Day”: The Vindication of Justice Stephen’s Dissent in Henry v Boehm (1973)’ in Andrew Lynch (ed), Great Australian Dissents (Cambridge University Press, 2016) 150. ‘Internationalisation and Different National Philosophies of Legal Education: Convergence, Divergence, and Contestability’ in William van Caenegem and Mary Hiscock (eds), The Internationalisation of Legal Education: The Future Practice of Law (Edward Elgar, 2014) 21. ‘Betfair Pty Ltd v Western Australia and the New Jurisprudence of Section 92’ (2014) 88 Australian Law Journal 204. ‘Reflections on the Internationalisation of Legal Education’ (2013) 119 The Chuo Law Review (Hogaku Shimpo) 60. ‘My Top Ten Tips for Good Deaning’ (2012) 62 Journal of Legal Education 70. ‘Recent Developments in Australian Legal Education’ (2011) 8 Chuo Law Journal 19 (Japanese), 53 (English). ‘The Path of the Law: A Tribute to Holmes’ (2003) 54 Alabama Law Review 1079.